For some years now we – really Mark, but we – have wanted to see Dubai. Big, gaudy, flashy; it just seemed like something we should see. Having now spent four days here I’m not feeling like I need to come back. Kind of like Las Vegas on steroids but without the casinos it’s worth seeing once. First, just where are we? 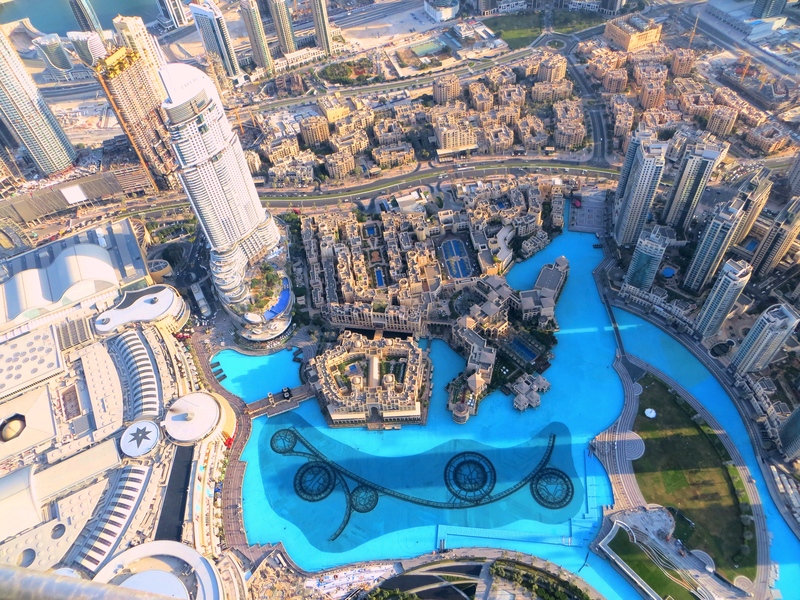 Dubai is a city of about 2.7 million people, the largest in the United Arab Emirates. But what is the United Arab Emirates? 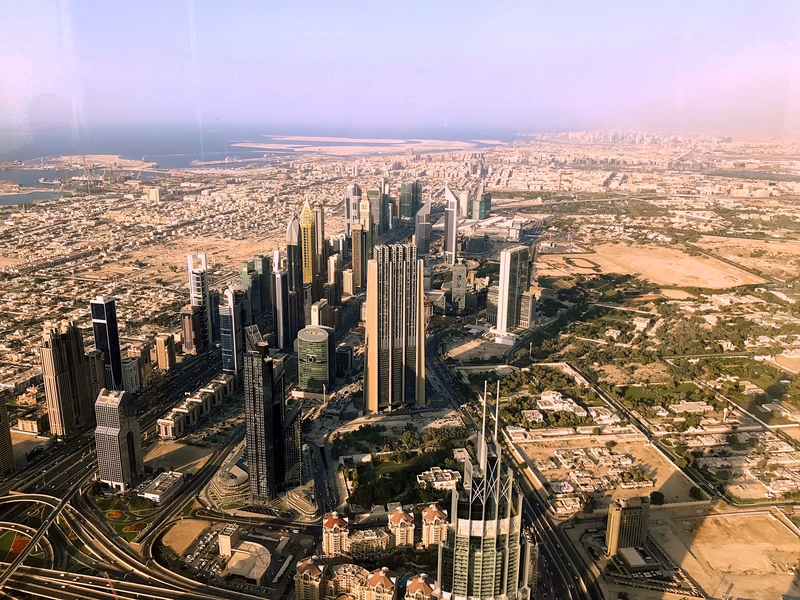 (Or should that be “What are the United Arab Emirates?”) They – it, OK, I’m going with the singular version – it is a monarchy that consists of seven constituent emirates, of which Dubai is the largest. Abu Dhabi is the second largest and together Dubai and Abu Dhabi make up about 75 percent of the total population. The federation was formed in 1971 after the British announced they were ending their role as protectors of the small sheikdoms. As Iran to the north and Saudi Arabia to the south licked their chops at the thought of snatching up these small, vulnerable plots of land Abu Dhabi and Dubai formed a partnership and offered membership to the other emirates. 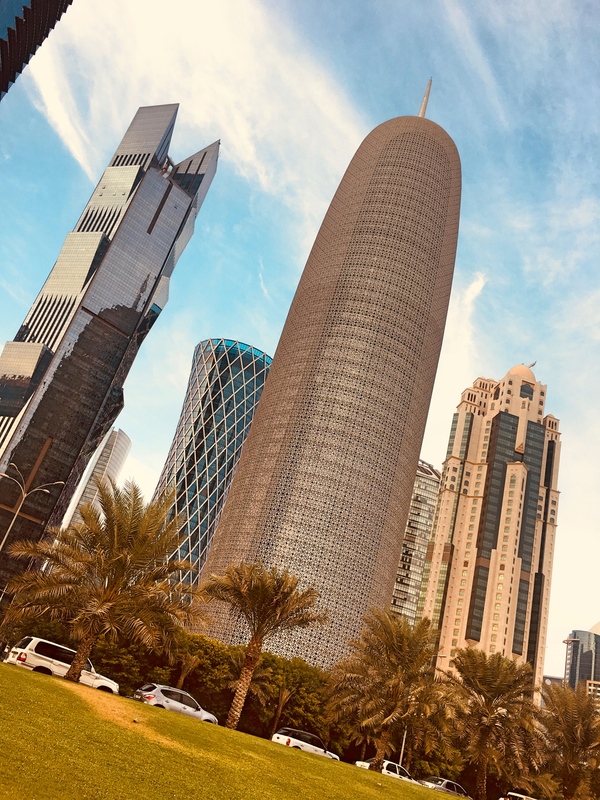 Qatar and Bahrain rejected the offer and thus are independent; Ajman, Fujairah, Ras al-Khaimah, Sharjah, and Umm al-Quwain said yes and today remain junior partners in the federation. So Dubai. Just about the same size as Rhode Island with one huge city and a lot of desert. Surprisingly not a lot of oil; oil wasn’t discovered here until 1966 and the reserves are quite small. In fact, oil makes up only about five percent of Dubai’s revenue. 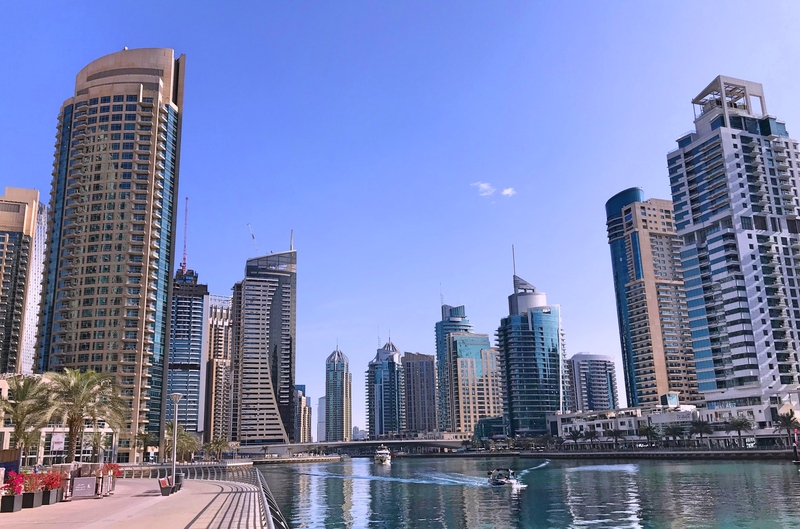 Instead it has established itself as a commercial center and more recently a transportation center and has become famous for impressive skyscrapers, particularly the Burj Khalifa. The Burj (Arabic for “tower”) was the main thing we came to see. 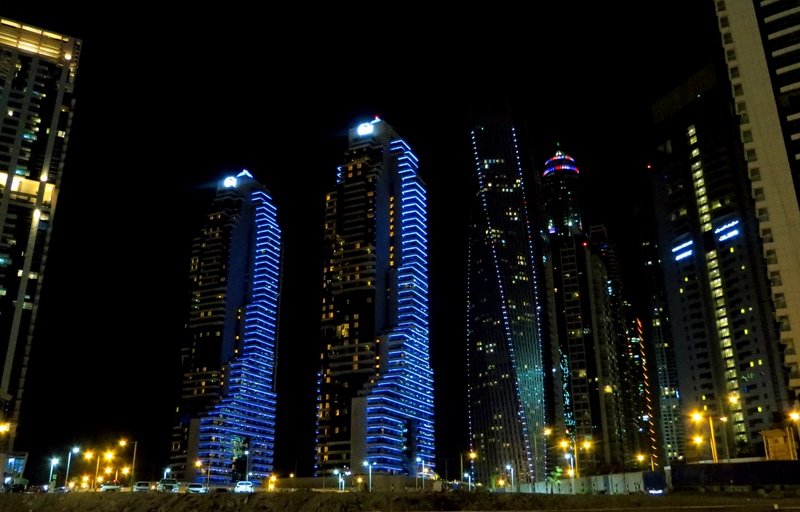 Construction began in 2004, when it was known as the Burj Dubai. For years they were cagey about just how tall it was going to be; they said it would be the tallest building in the world but wouldn’t put a specific number on it. Finally in 2008 it topped out at 2,722 feet compared to Chicago’s Sears Tower which was then the world’s largest building at 1,729 feet, so more than 50 percent taller than the next tallest building. Since then a number of extremely tall skyscrapers have been built but the Burj Khalifa is still 30 percent taller than today’s number two, the Shanghai Tower. Naturally, we went to the top. You sign up well in advance, have a scheduled time, and up, up, up you go to the 148th floor. Above that are six floors of corporate suites and then nine floors of mechanical and communication equipment. Until last year the observation deck, at 1,821 feet, was the highest observation deck in the world but in 2016 the Shanghai Tower’s observation deck opened at 1,841 feet. The views were impressive; on a clear day you can see all the way to Iran but it wasn’t that clear during our visit. In some ways, in fact, the tower was more impressive from the ground than the views from the top; it is a seriously beautiful building. Oh, and about that name. As I said it was known as the Burj Dubai during construction but the timing for the opening was about as bad as could be: they were marketing it in 2009 and it opened in 2010 just as the global economy completely tanked. Really bad timing and leasing went a lot slower than expected. 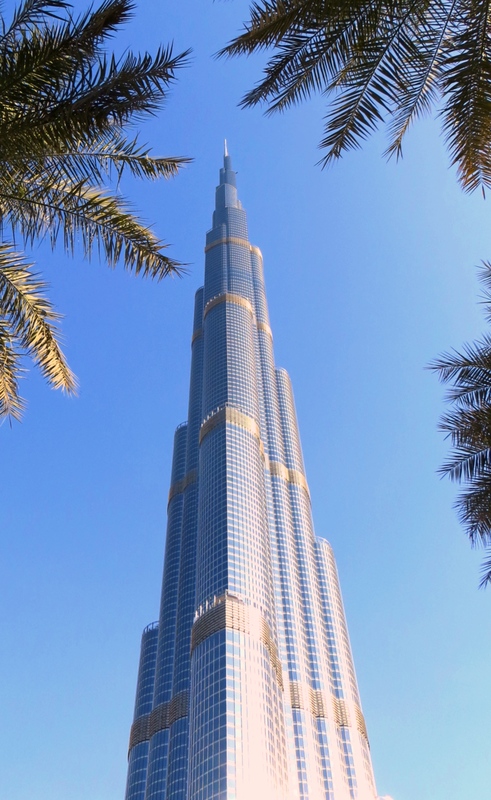 As a result Dubai needed a bailout from Abu Dhabi and the UAE so, at the opening, Dubai surprised everyone by renaming it the Burj Khalifa in honor of UAE President Khalifa bin Zayed Al Nahyan for his crucial support. What else is there in Dubai? A few things stand out. First, like Qatari and the rest of the UAE it is overwhelmingly made up of immigrant workers. Out of a total population of about 2.8 million people, fewer than half a million are Emirati. About half the remaining residents are Indians, with a large mix of other South Asians – Pakistanis, Sri Lankans, etc. – thrown in as well. And because most of those foreign workers are men there is a huge imbalance between men and women in Dubai. It seems as though that would cause trouble but if people cause trouble Dubai just sends them away. Oh, and it was weird just how spread out the city is. 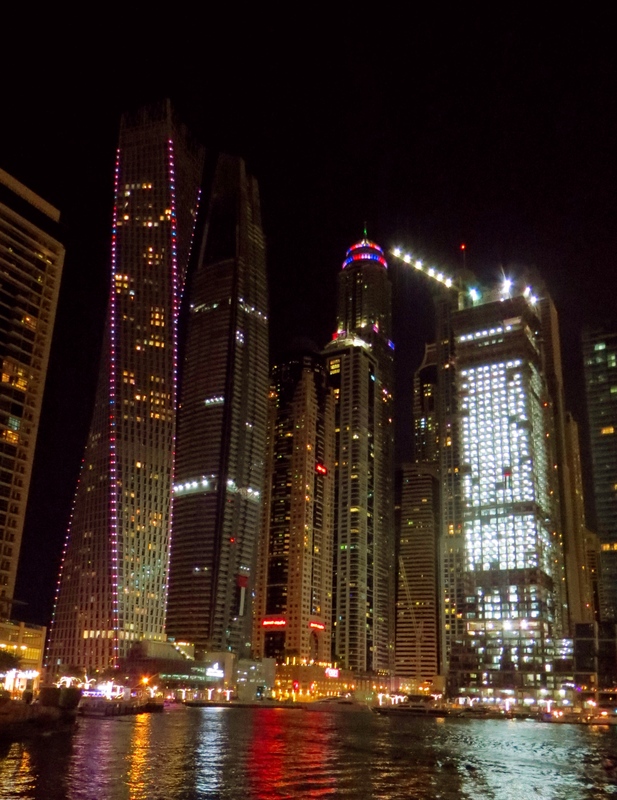 We were staying in the Marina area, a place with big skyscrapers and big hotels and big malls and all that, what one would think of as the city center. In fact the Burj Khalifa and the big malls around that area was nearly 14 miles away from our neighborhood. That’s a long way in a city. Beyond that, Dubai consists of a lot of big malls. We’re not big mall people, though, so there wasn’t much for us except updating our Apple collection; the AppleWatches we’d bought in China two-and-a-half years ago had started failing and, well, there was this new iPhone that came out recently that one of us needed. There was a beach at a neighboring hotel we had access to and that was OK. We were staying in the Marina area and there was a great two-mile winding walkway with soaring skyscrapers that was pleasant in the mornings and evenings. 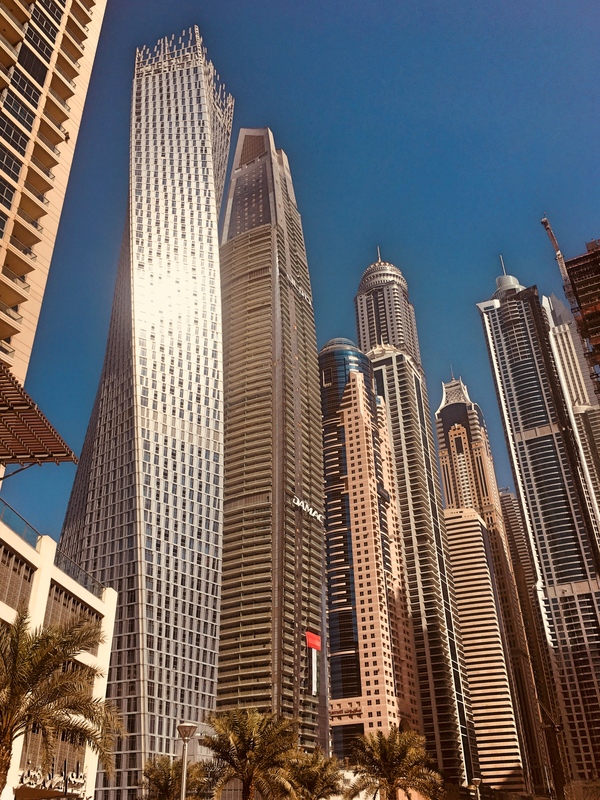 Except for the Burj Khalifa, though, the most notable thing about being in Dubai was the crazy mismatch between the cost of meals and quality of meals. Similar to our experience in Qatar alcohol can only be sold in the big international five-star hotels. 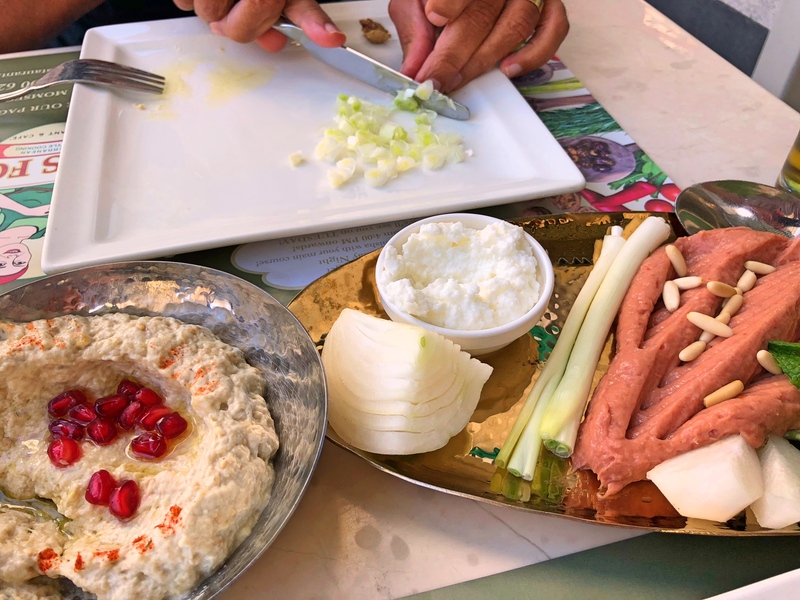 We had a couple of really good meals at Mom’s, a Lebanese restaurant near our hotel, at perfectly reasonable prices. But if you wanted a cocktail or wine? Absolutely insanely expensive and just not that good. That settles it, then. We’ve seen the Burj Khalifa, seen the attractive city scape, and satisfied our Apple cravings. 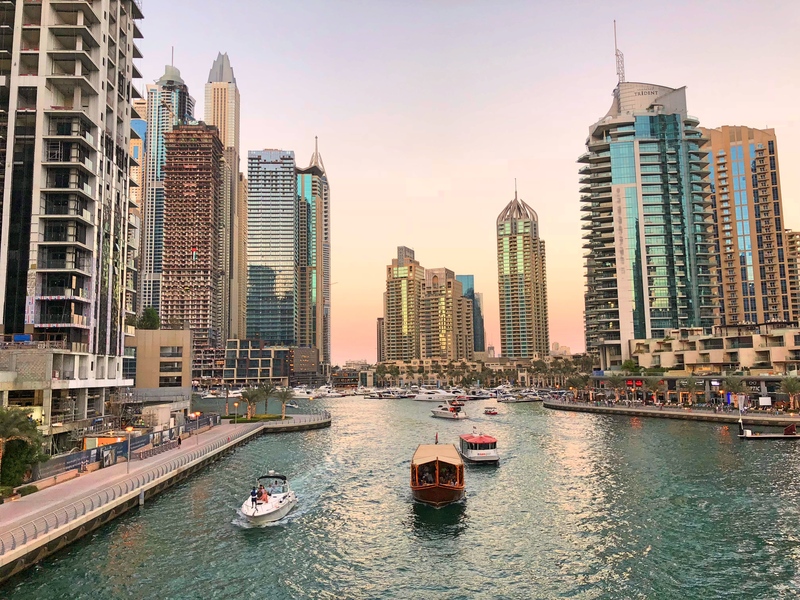 No need to come back to Dubai unless it’s the only reasonable transportation connection as we’re traveling between continents. 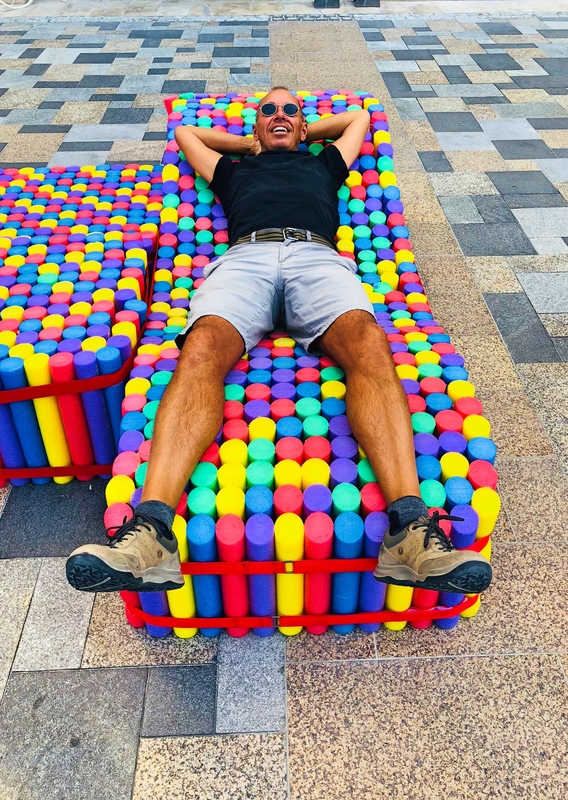 And here I am relaxing on some strange chairs Dubai set up in a pedestrian shopping area. Pretty chill! Qatar is a strange place. Sitting on a little peninsula on the northeast coast of the Arabian Peninsula, it is a world of contradictions. 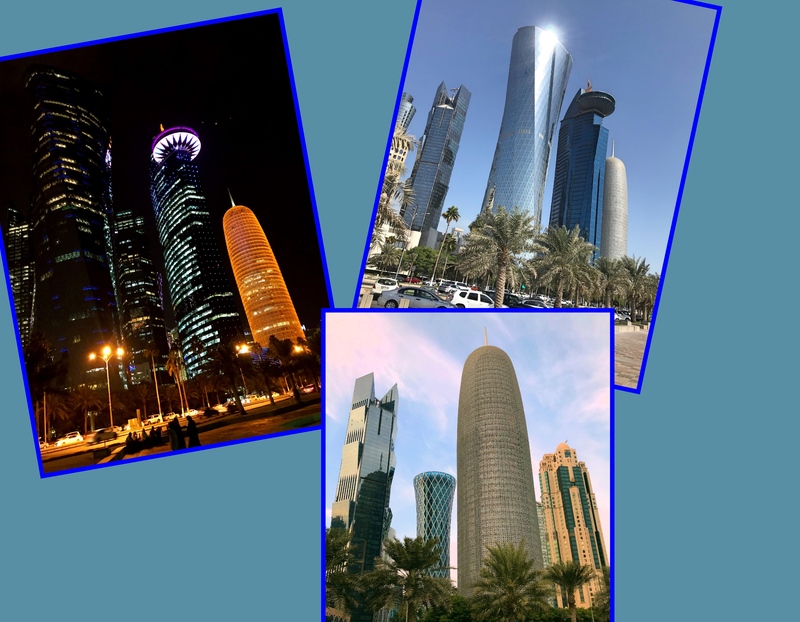 Based on petroleum wealth – it shares the world’s largest natural gas reserves with Iran across the Persian Gulf – Qatar is rapidly modernizing, yet it imposes punishments like lashings for illicit alcohol consumption. It has the world’s highest per capita income, but treats many of the enormous number of ex-pat workers as little more than slaves. Alcohol is served legally only in fancy international hotels but Qatari men can only enter in non-traditional clothes (and Qatari women aren’t allowed to enter at all). 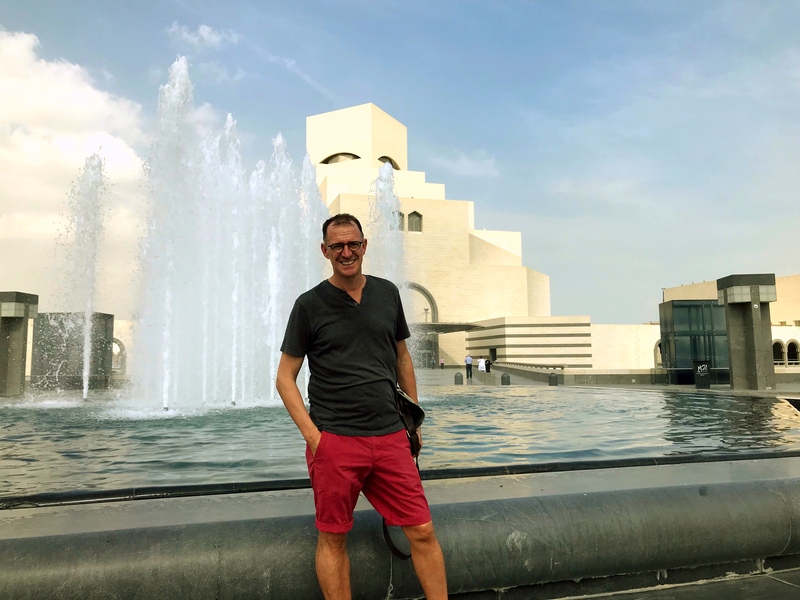 Qatari officials have done an amazing job with architecture in the new part of the city but it is one of the least pedestrian-friendly places we’ve ever been. It is an Arab country and key U.S. ally – it hosts a large American military base and has played key roles in both the war in Iraq and against ISIS – but largely allies politically with Iran. In other words, Qatar is a strange place. Here are two numbers that are stunning and go a long way to explaining this strange place: 2.3 million and 300,000. The first number reflects the number of foreign workers in Qatar, 2.3 million. The second is the number of Qatari citizens, 300,000. In other words a tiny number of native citizens being served by an enormous army of imported workers, mostly, though of course not exclusively, from the Indian subcontinent. Yet I was surprised by how much I liked it. The skyline and architecture and all that was way better than I’d expected. And it is all very much a work in progress, at times seemingly just one big construction zone. 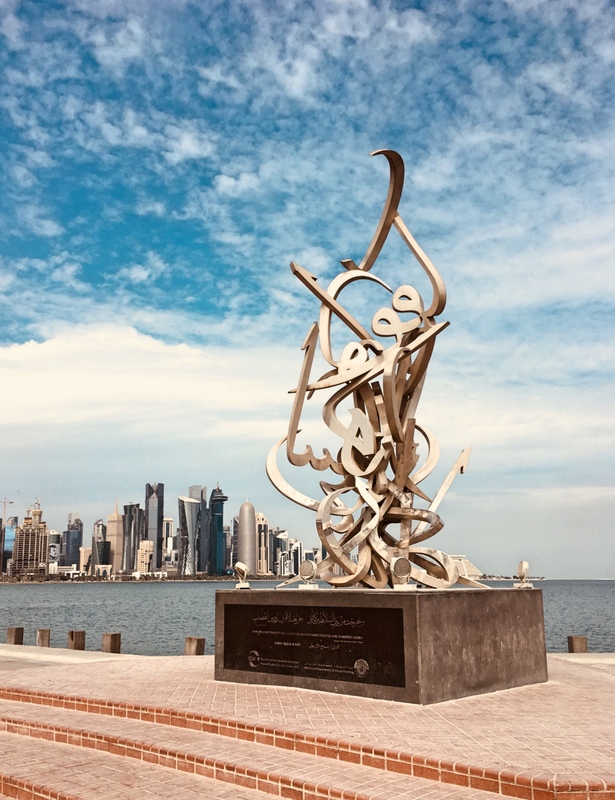 There’s a nice, long walkway along the coast – once you get to it; crossing the highway that runs along it is an act of faith – that comes alive in the evening as the temperatures start to cool down, the buildings lit in color, and neon-rimmed dhows plying the bay. 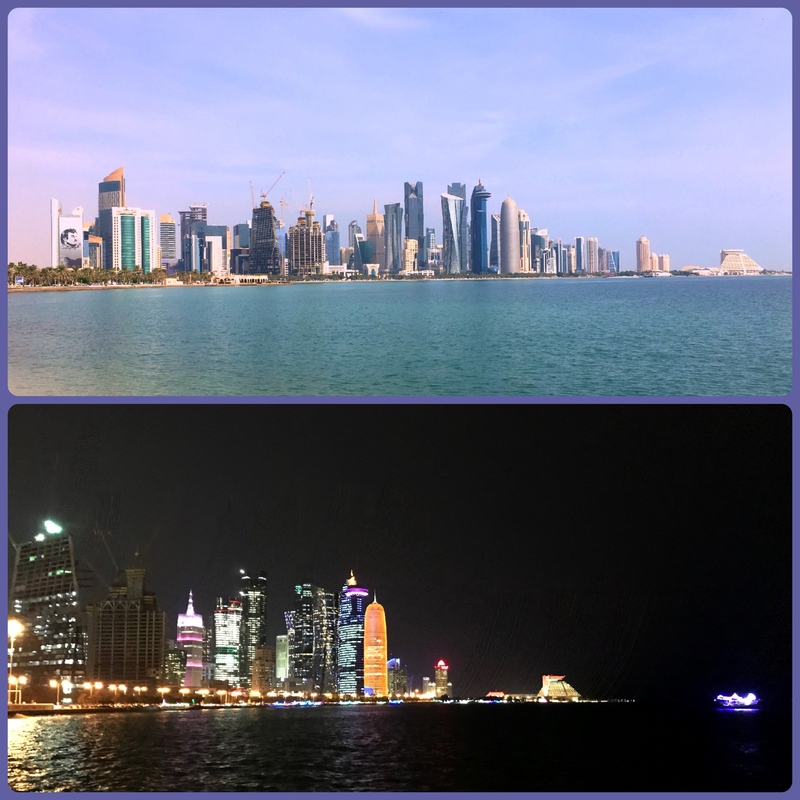 There’s a beach a couple miles north of town that we walked to, through ugly construction areas and along stretches that would have benefited from sidewalks (did I mention Doha is distinctly not pedestrian friendly?) 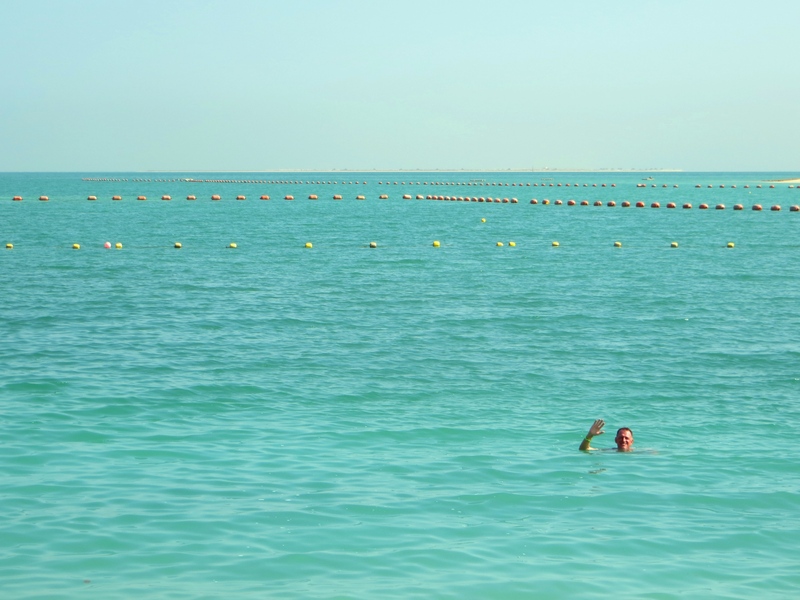 so we could swim in the Persian Gulf. One of the highlights for us was staying at the W Hotel. 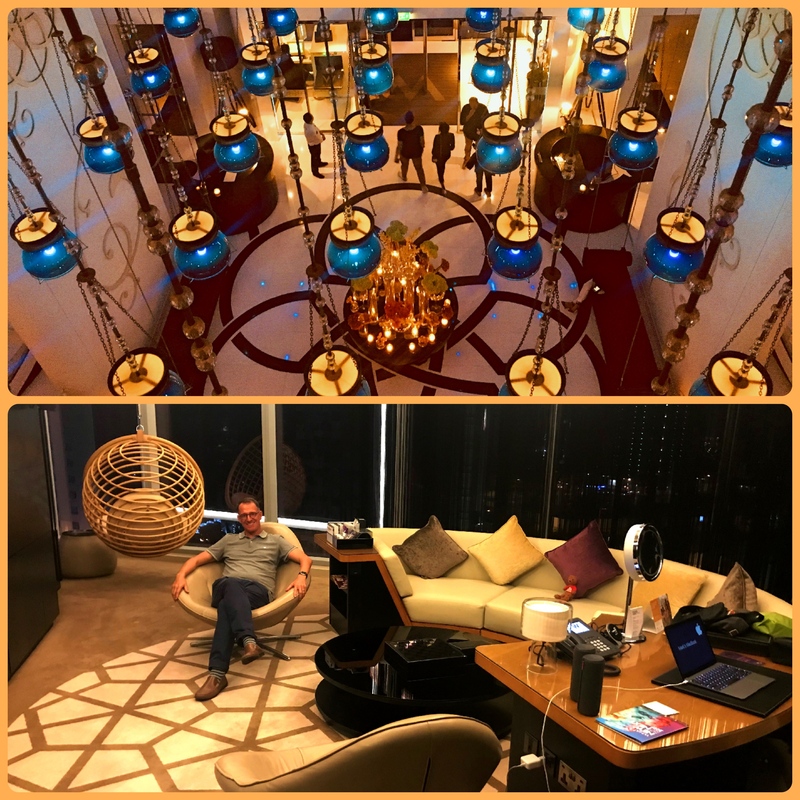 It’s stunningly beautiful and, because of that Starwood status we have, they upgraded us to a very cool suite, one of the nicest rooms we’ve had in this long adventure. That was really handy, since for a good part of the day it’s just too hot to do much, even in November (I can only imagine what it’s like here in the summer!) and we could hang out in all the space we had. 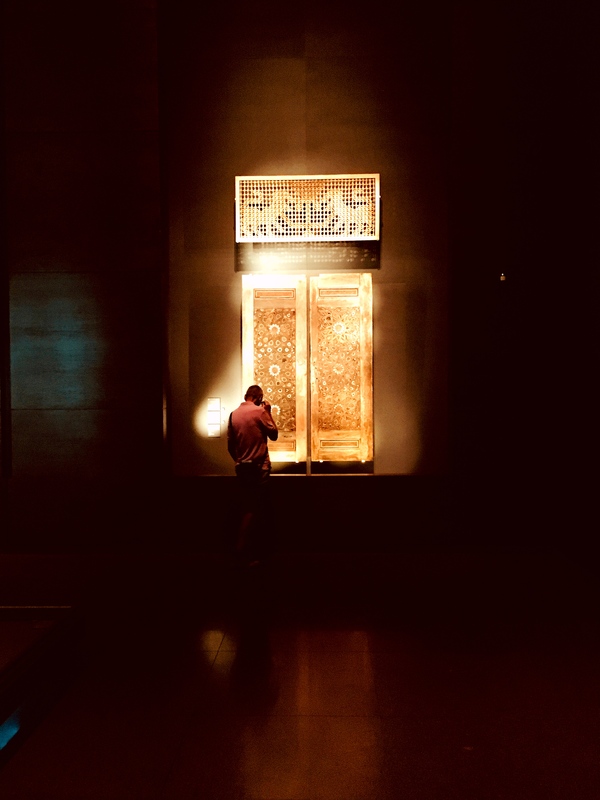 Perhaps the biggest tourist attraction in Doha is the Museum of Islamic Art, opened just nine years ago in a building designed by famed architect I. M. Pei. At the age of 91 he had already retired but the Qatari coaxed him out of retirement (think $$$) and he spent six months traveling in the Muslim world for inspiration. He ultimately rejected all the proposed sites for his museum, insisting instead that it be built on an artificial island so no other buildings could ever encroach. And believe me, it all works. The building and interior design are gorgeous and alone are enough to justify the price of admission; oh, wait, that wouldn’t take much since the museum is free, always my favorite price point. But the collection was impressive too, containing artifacts dating back to the 7th century, from the time of Muhammad himself. All beautifully displayed, I found myself wondering how the heck 9th and 10th century glass could have survived all those years. 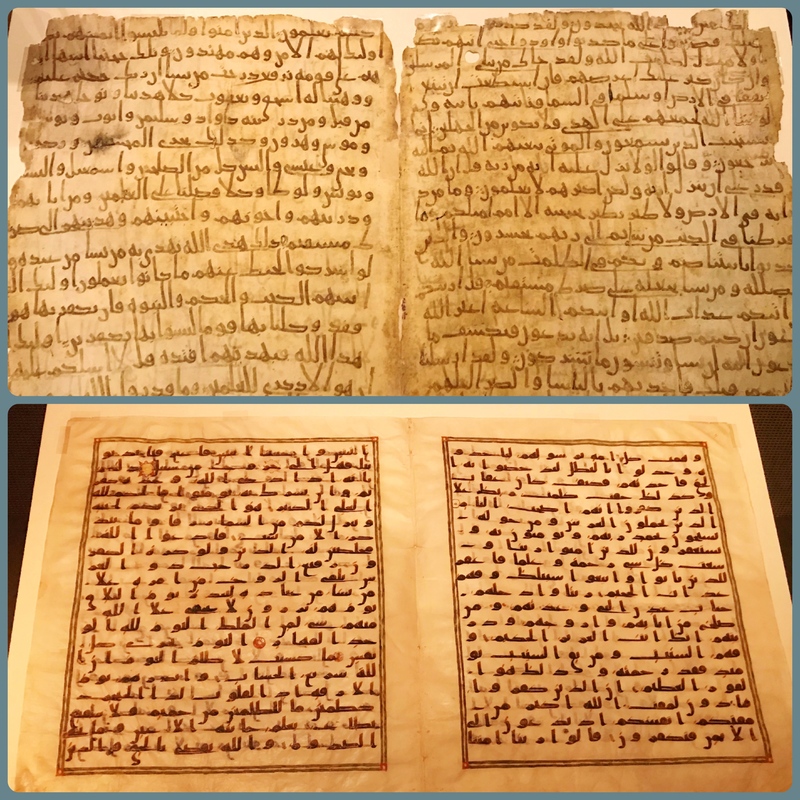 Pages from ancient Korans, the top one dated from the 7th century, the bottom from the 8th. Given that Muhammad died in 632, the top one in particular would have been written by people quite close to his lifetime. And then there was the walking along the Corniche, around the bay from the downtown area a couple of miles to the Museum of Islamic Art. Early mornings were cool and pleasant while during the daytime it was intensely hot. In the evenings, though, the temperatures dropped, the lights came on, and people came out. The strangest thing for me was seeing women out, obviously walking for exercise, with their full-body burkhas flowing in the evening breeze. As it got darker it seemed as though they got eerier and eerier, as though the Grim Reaper himself was stalking. 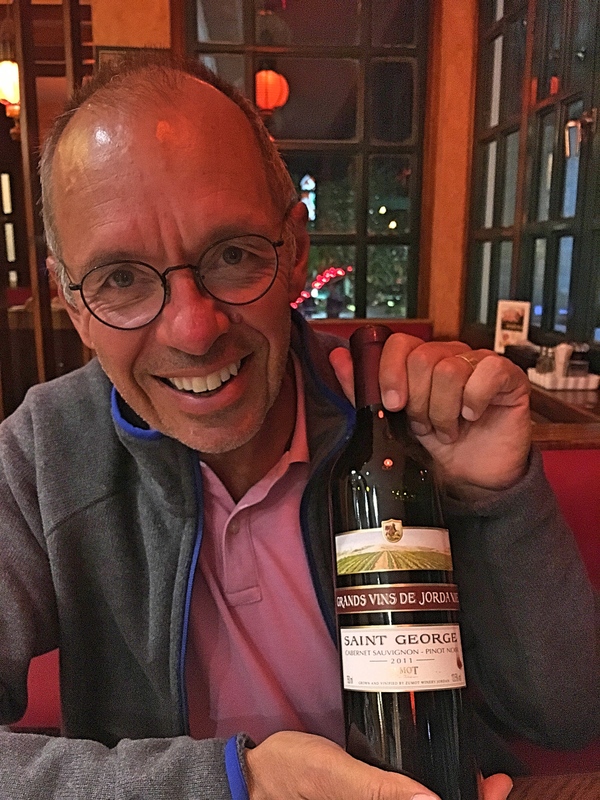 As for food, you have two choices: local fare at reasonable prices with no wine or alcohol, or fancy hotel restaurants at unreasonable prices with wine and alcohol. We compromised. 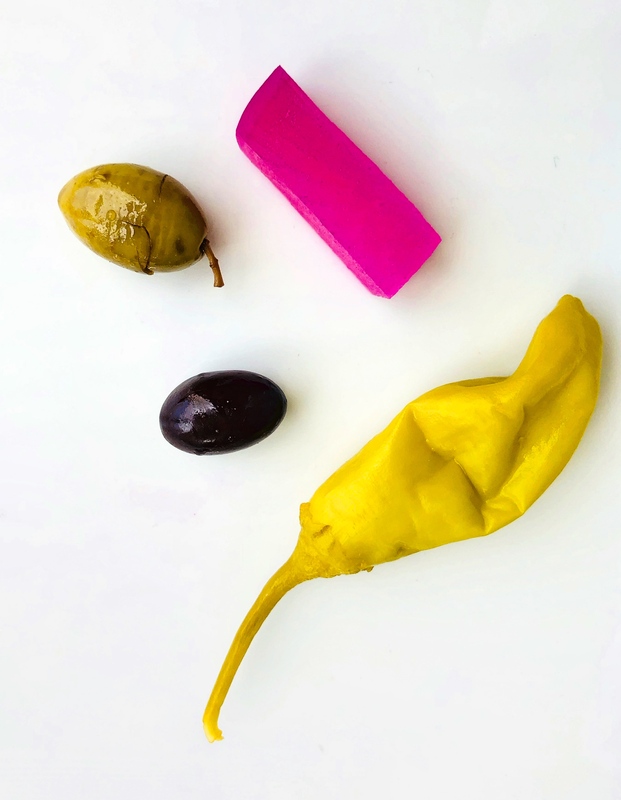 Lunch would be at a local place – good Indian, good Lebanese, and good Persian – and dinner would be at a fancy restaurant either in our hotel or a neighboring one. It worked. That was Qatar. We were kind of there just to check off a country but I found myself intrigued. I’m even looking forward to going back in four or five years to see how much it has changed. I expect it will be a lot. Artifacts from the museum. 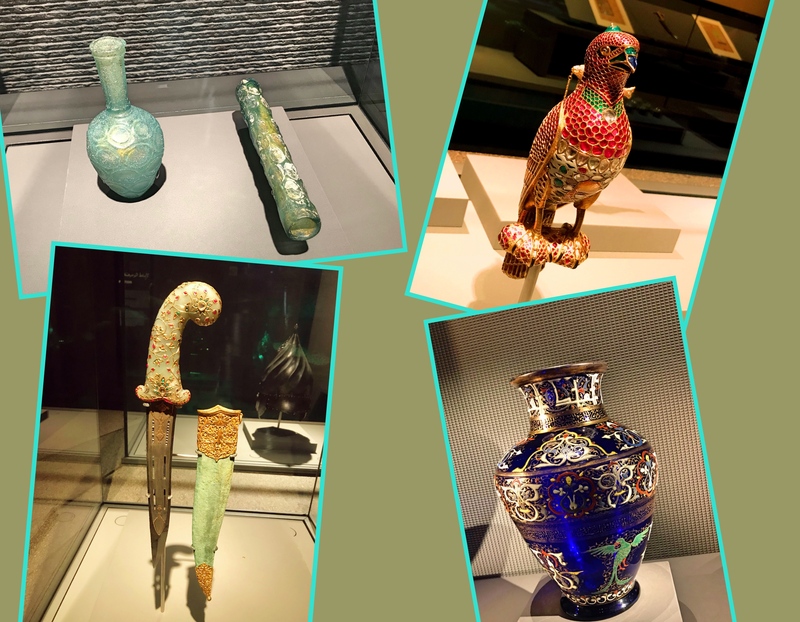 Clockwise from the top left that’s Iranian glass from as early as the 7th century; a 17th century jeweled falcon from India that includes diamonds, rubies, emeralds, and sapphires; a 13th century glass vase from Syria; and a gem-studded dagger and scabbard from India dating from about 1800. 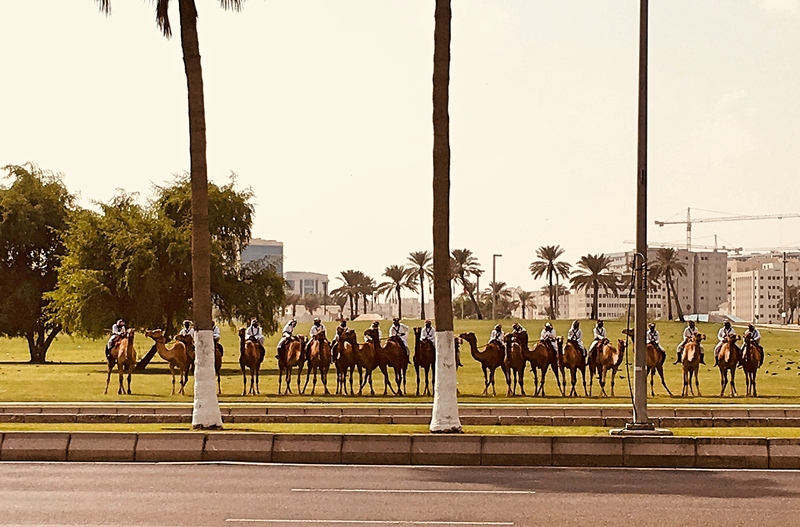 The morning we walked to the Museum we saw these camels and riders lined up right next to the royal palace. We weren’t sure what was going on, but it certainly made you feel as though you were on the Arabian Peninsula! 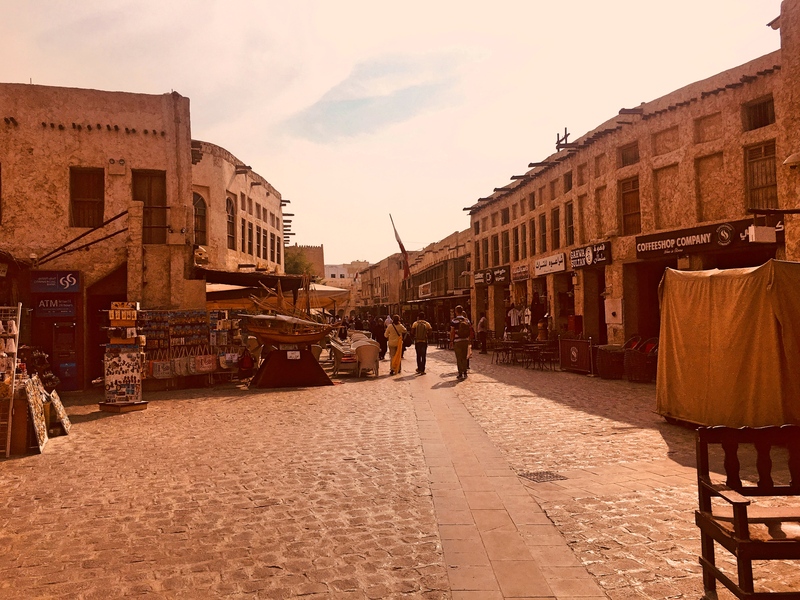 Doha’s old souk is a couple miles from the new, modern city. Not the most impressive souk we’ve ever seen but certainly worth a visit. And, importantly, this was where the good (alcohol-free) local restaurants were. 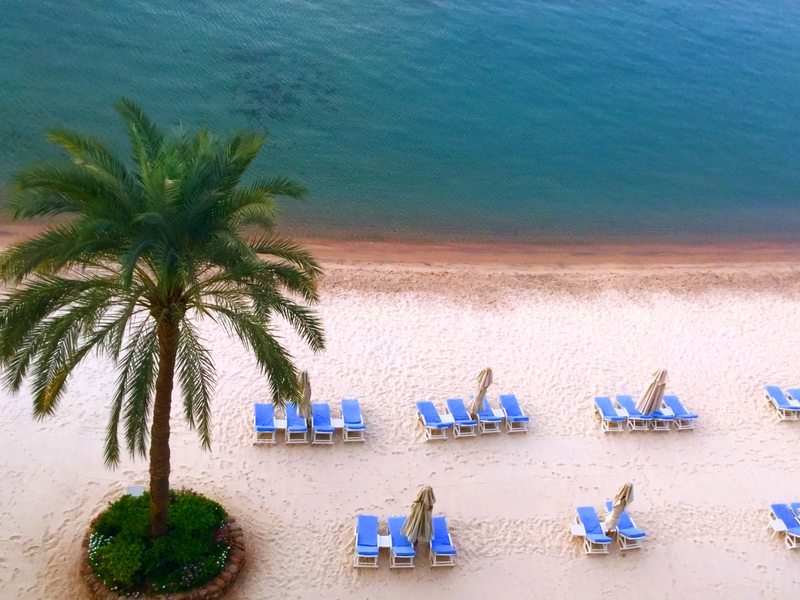 Our last destination in Jordan was Aqaba, the almost-landlocked country’s only seaport. The city sits at the tip of the Gulf of Aqaba, which itself is the northeastern extension of the Red Sea. Given Aqaba’s location at the very intersection of Asia and Africa, along with its easy access to Red Sea shipping, it has been an important trading city for millennia. There was one big event here more recently. In 1917 the Arab Revolt came to a conclusion here in the Battle of Aqaba, ending 500 years of Ottoman rule in what was then called the Province of Syria, or what we might today call Greater Syria. You may have seen the battle on the big screen; one T.E. Lawrence was a senior advisor to the Arabs and the battle was depicted in the movie Lawrence of Arabia. 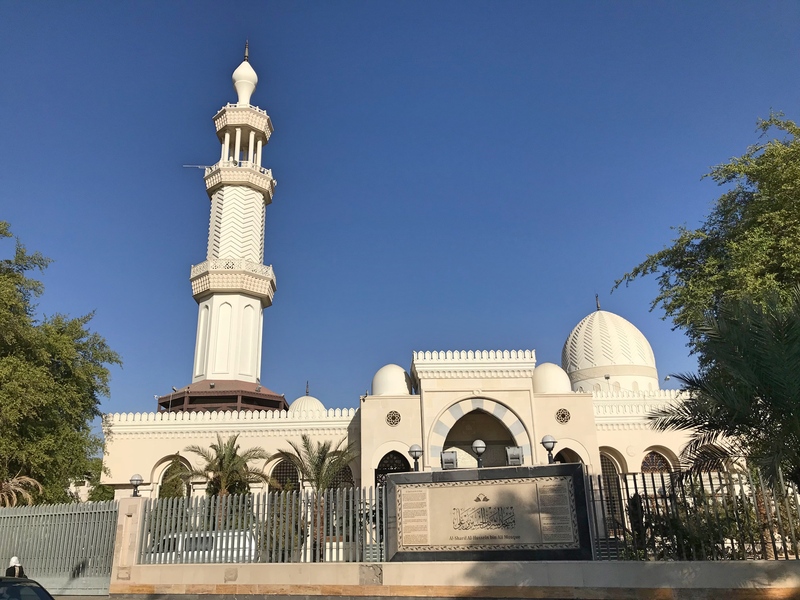 The Al-Sharif Hussein Bin Ali mosque, built in 1975. It is named for Hussein Bin Ali, the Sharif of Mecca who proclaimed the Arab Revolt in 1916. After the Revolt’s success he rejected the Treaty of Versailles in protest of the Balfour Declaration and the British and French mandates in Syria, Lebanon, and Palestine; he had fought for freedom, believed he had been promised freedom, and wanted to lead a pan Arab nation. Instead he was exiled to Cyprus, though today his great grandson is King Abdullah of Jordan. And that’s about all that was interesting here, which is why there are so few pictures. 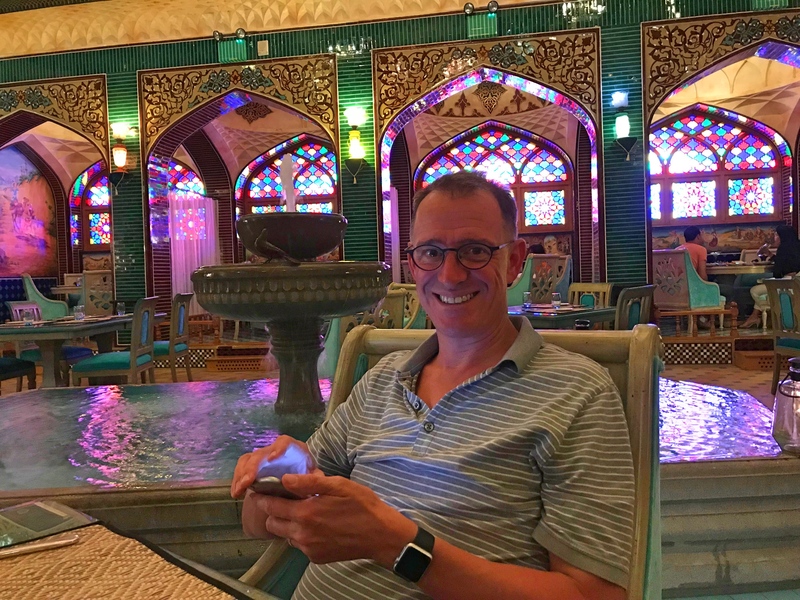 I wanted to see Aqaba and I was intrigued to find myself in Jordan, where you could go a couple miles east to Israel, maybe another seven or eight miles south along the Gulf to Egypt, and just 16 miles straight south to Saudi Arabia. Ultimately, though, there’s really not much to do here. 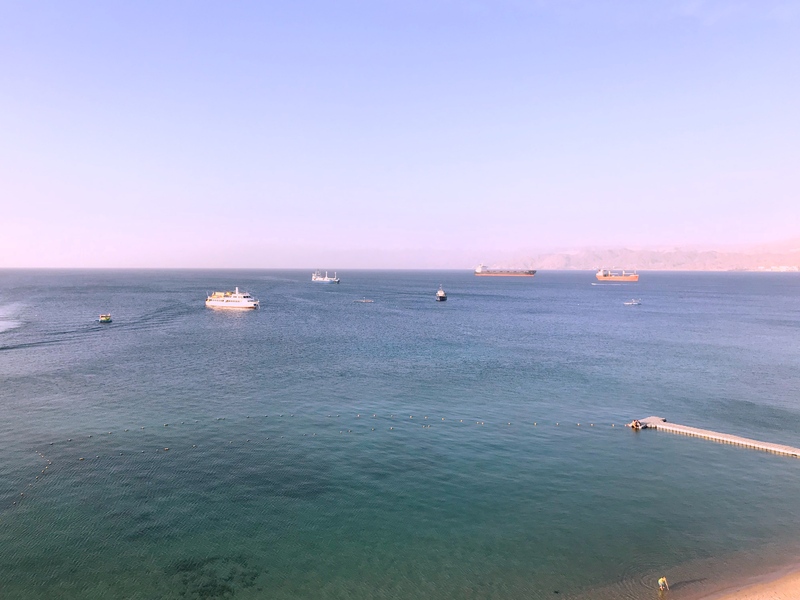 The Gulf of Aqaba is supposed to be an excellent area for scuba diving, but we haven’t done any of that in eight or 10 years. There’s a beach, and we spent plenty of our time there, but it certainly wasn’t one of the great beaches we’ve ever seen. For the most part the restaurants were … OK. We continue to find it weird how many restaurants won’t (can’t?) sell wine or liquor and that just makes them kind of boring. There was one great and unexpected find: a Chinese restaurant that made us feel as though we were right back in China. Otherwise? Meh. And thus, after a four-hour drive back to Amman where we enjoyed one last great lunch and an overnight stop, it was time to leave Jordan. Petra, of course, was the standout star, but I’m also glad I got to bob in the Dead Sea. From here we fly down to Qatar where we’ll spend nearly three weeks on the Arabian Peninsula.